The Yankees versus the Red Sox, the Celtics versus the Lakers, the Bears versus the Packers. 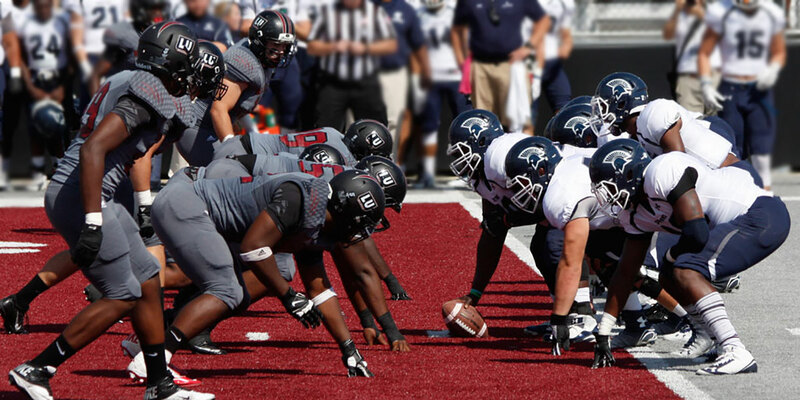 Rivalries have always been a major staple in the world of sports, and Missouri Baptist University is no stranger to this concept, having dueled with Lindenwood-Belleville University every year since the program has formed three years ago and developing a heated rivalry between the young football programs. The two teams duked it out to a 14-7 Spartans win Saturday, Oct. 8, in a game befitting of such an intense rivalry, as the teams went to overtime to settle things. This marked the first-ever overtime game played by the MBU Spartans. While last week was an offensive showcase for the ages, this week MBU had to fight through a defensive slugfest with the Lynx as neither team managed to score until MBU’s Devin Michael-Griffin, a freshman wide receiver from St. Louis, hauled in a 13-yard touchdown pass from reigning offensive conference player of the week Gunnar Griffin, a sophomore quarterback from Paso Robles, Calif., with 1:13 left in the first half. Griffin unfortunately followed up his record-shattering game against Taylor University the previous week with a 165-yard, three-interception performance, but did also throw a pair of touchdown passes that led the Spartans to victory. The game had a heated feel to it, as the Lynx continued to burn themselves with unsportsmanlike conduct and unnecessary roughness penalties, surrendering a total of 166 yards in penalties by game’s end. The Spartans managed to keep their heads through the trash talking and late hits coming from the other side, committing just 82 yards worth of penalties, most of which came on technical fouls such as holding and offsides. Apart from penalties, however, both defenses played extremely well, with MBU managing just 242 yards of total offense and Lindenwood-Belleville mustering up a total of 220 yards. Both teams managed to force five takeaways each, most of which came in key situations. The Lynx tied the game early in the fourth quarter, 7-7, and had multiple chances to win near the end of regulation but blanked on both, first by missing a field goal with over two minutes to play. Then, with under 30 seconds in regulation the Lynx had the ball near field goal range, but threw one last pass to the end zone to see if they could score a winning touchdown. The pass was intercepted by Eddie Calderon, senior safety from Marin County, Calif. The Spartans put the game back into the hands of quarterback Griffin as he scrambled to his right and looked to take off running with the ball, but just as a mass of Lynx defenders surrounded him, he made arguably the play of the year by jumping into the air and tossing the ball to a wide open Shaun Calhoun, sophomore wide receiver from Chicago, for a 23-yard touchdown in the opening frame of overtime. Then, just as the story seemed to be all game long, the Spartans’ defense was asked to make the play that would secure the victory, and they delivered, stripping Lynx quarterback Darrien Boone of the football as he tried to run and recovering it to record the game-winning stop, MBU took home a 14-7 overtime victory over their rivals from across the river. For the past season-and-a-half the Missouri Baptist University Spartans football program has been starved for a victory. After going 0-10 in 2015 and then starting the 2016 season 0-4, the Spartans picked up their first victory of the season with a thrilling 43-42 win over the Taylor University Trojans. It was a huge game not just for the team as a whole but for several individual Spartans as well, namely Kalen Petty, who broke a school record, Gunnar Griffin, who went from third string to impressive starter at quarterback, to Ethan Metzler, who never kicked a field goal in college before nailing three crucial ones, including a game winner. Petty, a junior tight end from St. Louis, set the school’s all-time receiving yards record for a single game with 168 on six catches as well as scoring once and recording MBU’s longest play from scrimmage in school history, a 79-yard catch-and-run in the third quarter. Petty was not the Spartans’ only big receiver on the day though, as Devin Michael-Griffin, a freshman wide out from St. Louis, hauled in six passes for 135 yards and two touchdowns as well as adding 94 more yards in the return game. It was not surprising that multiple Spartan receivers had monster games considering the day turned in by MBU’s quarterback, Griffin, a sophomore from Paso Robles, Calif., who completed 28 of his 46 passing attempts (61 percent) for a school-record 481 yards and four touchdowns as well as adding a touchdown on the ground as he ran it in from 3 yards out to open up the scoring for MBU. Griffin’s day was extraordinary enough to win the American Midwest Conference Offensive Player of the Week award and is made even more impressive considering that he entered the season as the third quarterback on the depth chart but was called into action thanks to a slew of injuries at the position. Griffin was, however, not the only Spartan thrown into the lineup Saturday due to injury who would come up huge in the victory as the team was also without its reliable junior kicker Alex McGlassion, who was replaced by Metzler, a sophomore from Erie, Colo.
Metzler had never even attempted a kick in a game prior to Saturday’s contest against the Trojans, but he nailed three field goals on the day, including the game-winner with 1:46 left in the game from 32 yards out. “Before the play I walked up to Ethan and asked him if he thought he could make this kick and he told me, ‘I’ll give it everything I’ve got,’ and to be honest I never had any doubt,” said head coach Jason Burianek. One of the biggest keys for MBU in the game was the turnover differential, in which the Spartans took a decisive 4-0 edge over the Trojans, thanks to Eddie Calderon, a senior safety from Marin County, Calif., who recorded two interceptions and a fumble recovery in the game, including one with less than a minute to play in the first half when the Spartans trailed 21-10 and the takeaway quickly led to a Petty 27-yard touchdown. Despite a blocked point-after attempt the sudden change before halftime definitely swung the momentum over to MBU’s side and carried over to the second half as the Spartans stormed back to eventually complete the comeback victory. Sophomore defensive back Dontrail Johnson, from Webster Groves, jumped on a fumble as well in the game. The Spartans entered the fourth quarter trailing 35-26 but pushed through to outscore the Trojans 17-7 in the final quarter to get a 43-42 win. The Spartans travel to Bourbannis, Ill., Saturday, Oct. 15, to face the currently 1-4 Olivette Nazerene University before they finally return to St. Louis for their Homecoming game on Oct. 22 against Saint Ambrose University. Aaron Feeley is a staff journalist and anchor for MBU Timeline. He majors in Broadcast Media here at Missouri Baptist University. Feeley plays Tight End for the MBU football team and came to St. Louis from his hometown of Naperville, Illinois. Feeley enjoys watching, playing, and broadcasting almost any sport and hopes to work as a sports broadcaster after graduation.